Hobby update 30/5/17 - slaves, slaves everywhere, but still nothing actually finished! Greetings all, as always I'm a little off-schedule thanks to the Bank Holiday, but in other news, at least that meant I got loads of painting done this week! Seriously, first I have to give thanks to my wife for taking our kids up to see her family and leaving me behind, and then also thanks to my pal Martin for coming over and keeping me company while we painted. For many hours. Funny Friday - what are the Death Guard up to? Greetings all - one of my own concoctions today, and a rather more topical one than usual! You won't be able to unsee that now will you! Greetings all! Honestly you take a little break from things and next thing you know there's a new boxed set and a release date on the horizon! Let's jump right in with the elephantine Death Guard in the room though shall we? Greetings all - let's do a hobby post today shall we? Where am I getting to with the slaves to darkness I've been painting? Before I get stuck into it - might I just point out that I'm taking on commission work again as my current list is almost complete. Greetings all - a little goodie bag for you today! Having recently started playing Age of Sigmar, I have found there's a lot of record keeping I need to do during a game - which spells have affected which units, what bonuses have been granted etc. To fix that, I made myself some tokens, and I figured I might as well make them available to all you good people too. They're 32mm circles, so all you need to do is print them off and cut them out, then if you want to make them a bit more robust, mount them to any of the many 32mm round things you can find out there! bonus special photo post today, I finished my first Chaos Knight last night and I'm so chuffed with the results I couldn't wait to show him off till monday. I think this is quite possibly the best painted miniature I've ever done. There are still a couple of little things I want to go back and improve (aren't there always) and I'm going to be applying some blood splatter when I get around to it, but essentially this is finished. Greetings all - today I'm skipping over some of the last rules snippets we've had from GW (they'll be at the bottom of the post) to focus on something that is a little higher up in my sphere of interest. Primaris Space Marines. 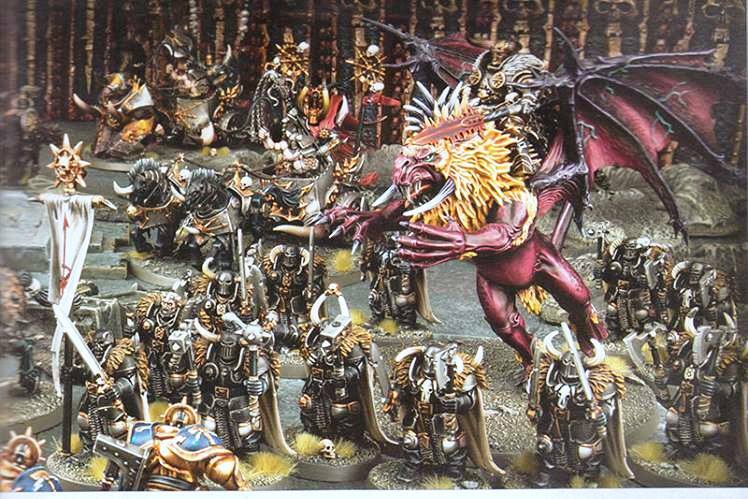 These guys are the next generation of Space Marines, developed in secret by Archmagos Belisarius Cawl at the behest of Roboute Guilliman at the end of the Horus Heresy. For 10,000 years Cawl has worked in secret on developing these guys and now he's finished (presumably once the project was complete, he realised he had to go and wake up his client!) 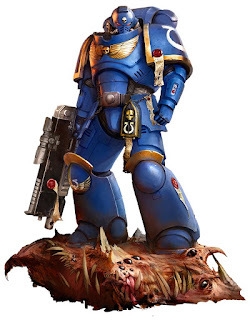 Guilliman is shipping them out to various locations across the galaxy to reinforce the Space Marine Chapters to allow him to conduct his Indomitus Crusade. Hobby update - the challenge of painting white. Greetings all, here's a quick look into the rubble-strewn landscape that is my painting table this week. Today, given the models that I've been working on this week, I'm going to take a quick look into a question that has vexed many a gamer over the years. How do I paint white? Greetings all - another rules update for you from the hallowed halls of GW. This last couple of days we've been showered with yet more snippets of info about the forthcoming 8th edition. 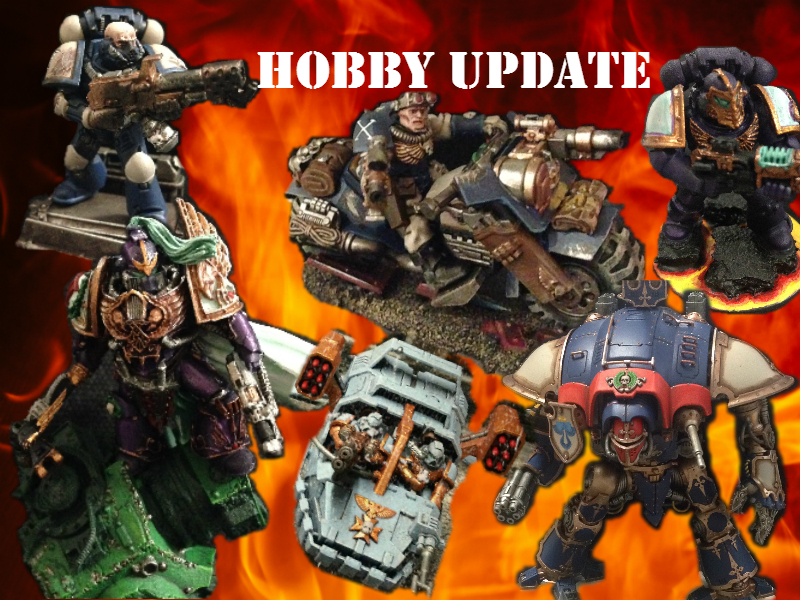 Hobby update - 8/5/17 - thundering hooves. Greetings all, welcome once more to the lair of my mad science, a glimpse into what projects I'm working on, be it construction or painting. This week I have a mixed bag for you, as my burgeoning Slaves to Darkness force muscles in on the tabletop action. Greetings all - time for another rules update! This one covers the last couple of snippets we've had over the weekend and today, dealing with large models, and infantry. As usual, I'll follow on the released information with a quick assessment of what that's likely to mean for us going forward. 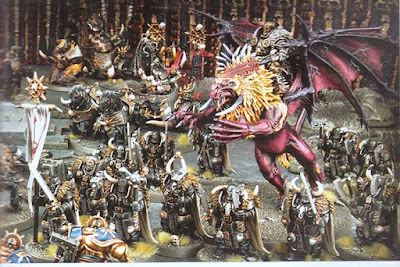 well here we go again with another post on some release information GW are drip feeding to us on facebook (anyone else noticed it goes up on facebook waaaay before their own community site?) this time we're talking about morale. So, last night I had my first game of Age of Sigmar. I'm impressed, despite being totally new to the system I didn't feel totally inept and by the end of the game I was actually following what was happening more or less. here we go again - more updates on the snippets of rules released, today I look at the last 4 - Movement, Psychic, Shooting, Charging and Fighting.